A few weeks ago I wrote a post about installing additional insulation in the ceiliing, Green Technology that pays for itself. 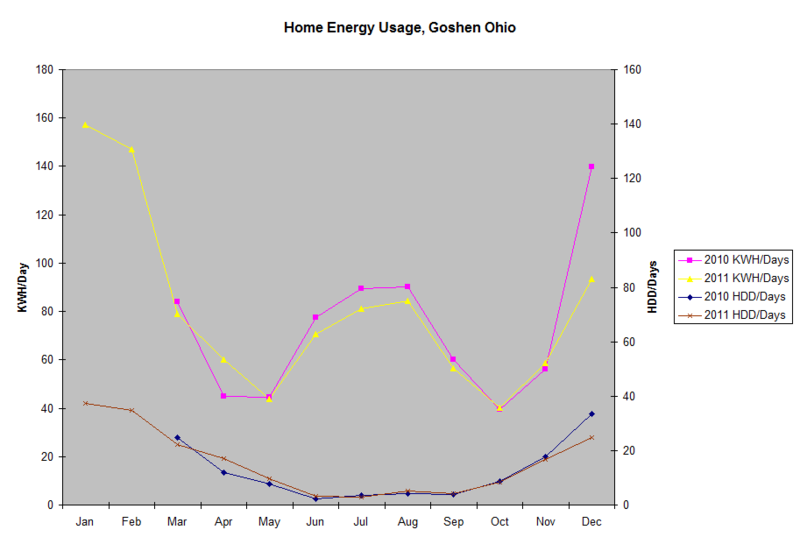 Recently I was pleasantly surprised when I received my December electric bill. It was down 38.8% compared to last year. The drop was larger than I expected so I decided to update my spreadsheet with the heating degree days, kilowatt hours, and cost. The largest contributor to the drop comes from a 25.7% drop in heating degree days. This year has been warmer than last year. When we adjust the numbers for the lower number of heating degree days, we can see the effect of the insulation in a lower amount of kilowatt hours used per heating degree day. This year I estimated that the additional insulation resulted in 10.2% drop in kilowatt hours and a $29.78 drop in the total bill. Here is my updated chart.